’Twas all for a lassie called Sally Munroe. A distance in the country from Sally Munroe. For he never gave that letter to young Sally Munroe. It was there I by chance did meet young Sally Munroe. And there I did embark with Sally Munroe. Oh, I was quite happy with young Sally Munroe. And among that great number I lost Sally Munroe. And I’ll mourn all my days for young Sally Munroe. This month’s song is another for which I transcribed the melody from a 1924 wax cylinder recording of Minnesota singer Mike Dean. The text is, again, from Dean’s 1922 songster The Flying Cloud. 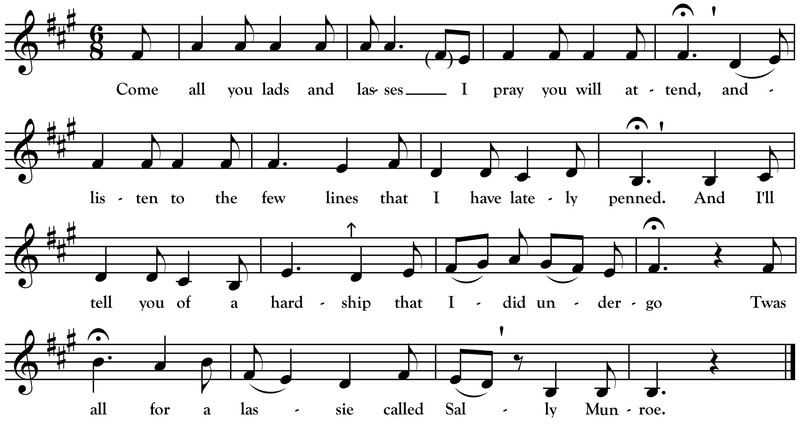 The song is a rather rare one dating back to the 1830s when it was printed as a broadside (cheap song lyric sheets sold on the street by singers) in northern England and Scotland. * It was likely inspired by an actual event: the 1830 shipwreck of the ship “Newry” which sailed from Newry town with 400 Irish emigrants aboard bound for Quebec but wrecked off Bardsey Island near the Welsh coast where 100 perished. In some of those early broadside versions, Jim Dixon is born in Ayr, Scotland, goes to Belfast to work where he meets Sally and then sails from Newry but shipwrecks en route to Quebec. The song crossed over to North America where it was collected mainly in Newfoundland and the Canadian Maritime Provinces. Place names vary between most versions. Dean’s version is special because it is the only one collected from a Great Lakes region singer. Also, the abundant place names in Dean’s might indicate it came from southeastern Ontario. Fort Erie, Belfast, Norwich and Williams’ Point are all places in that part of Canada. This was an exciting one to hear on the recently rediscovered cylinder recordings! Dean has a very striking melody for the song which is different than any other I have found.